There is probably no more festive time to visit England than during the holidays. The towns and villages are all done up in lights and the trimmings conjuring up days of yore. Just 90 minutes west of London by train, Southwest England has some of the country’s most stunning coastline and quaint villages. The area has developed a taste for luxury over the centuries with huge castles turned into hotels, some of the finest food and drink, and a rich, historic culture. 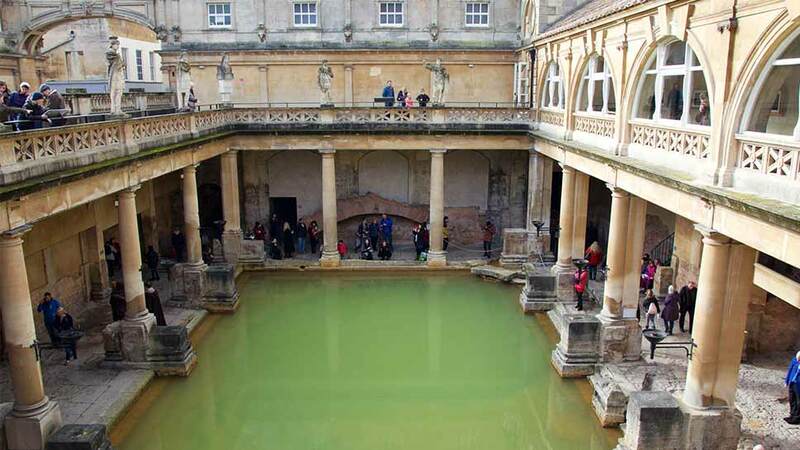 Sophisticated Bath is a designated UNESCO World Heritage Site and spans a history of 2,000 years beginning with the Romans who took to the healing waters. Home to some of the finest architectural sights in Europe, Bath is most famous for its Georgian architecture—graceful streets and sweeping terraces such as the Royal Crescent, Palladian-style villas on elegant squares, and classical facades in warm, golden-hued stone. The architecture stems from the 18th century boom, when Bath became a fashionable spa resort. Each year, the center of town is transformed into a magical holiday shopper’s paradise at the Bath Christmas Market where more than 170 chalets packed full of gorgeous gifts line the streets surrounding the Roman Baths and Bath Abbey. Thanks to its natural thermal springs, the city has become a major spa destination with the opening of the luxurious Thermae Bath Spa. Right across the street, the Gainsborough Bath Spa (thegainsboroughbathspa.co.uk), which just opened last year, is the United Kingdom’s first hotel to feature its own thermal water spa. The luxurious hotel and spa has tapped into the city’s subterranean springs reimagining traditional bathhouses with a contemporary twist. Upon my arrival down in the “spa village,” I met with the aromatherapy “mixologist” who offered me a special, cleansing juice. Then, after filling out a questionnaire about my current state (Jet lagged? Yes. Stressed? Sure. ), he whipped up a customized pouch of smelling salts for me to bring to the sauna. In a luxurious setting complete with columns and mosaic tiles, you can relax in the three soaking pools, an infrared sauna, and a cold room. And perhaps the best part? An offering of decadent spiced drinking chocolate. After a couple days exploring Bath (including a tour through the original Roman Baths and traditional English tea at the elegant Pump Room), hit the road to explore the region. If you are wary of driving on the left and would rather just sit back, you can always hire a driver. Chirton Grange (chirtongrange.co.uk) specializes in first class, bespoke chauffeur service across the U.K.
Just an hour’s drive southeast is Salisbury, most famous for its stunning, gothic cathedral. Take a wander through the holy halls, a place of worship for more than 750 years. It has the tallest spire in Britain and is home to the best-preserved copy of the Magna Carta. During your road trip, be sure to stop for a break along the way at the atmospheric Greyhound Inn in Corfe for the area’s popular English Cream Tea. And don’t be mistaken; this is not simply a drink break, but an afternoon meal of tea with a combination of scones, clotted cream, and jam. When you reach the coast, check into the Pig on the Beach hotel (thepighotel.com/on-the-beach), exuding homey charm with a touch of luxury. The 23-room country house is perfectly situated along rural Studland Bay with uninterrupted views of long stretches of sandy coastline. Definitely make a reservation for dinner here and you will know why they bill themselves as ‘a restaurant with a hotel attached.’ The one-of-a-kind greenhouse restaurant takes enormous pride in its fresh, British garden food. Committed to their “25-mile” menu, what can’t be grown in their garden, is sourced locally, as you will see from the menu with dishes like the Houghton Spring arctic char and smoked beetroot to the Whole Lyme Bay flounder and Hampshire chorizo. The next morning, bundle up and stretch your legs on the Jurassic Coast. 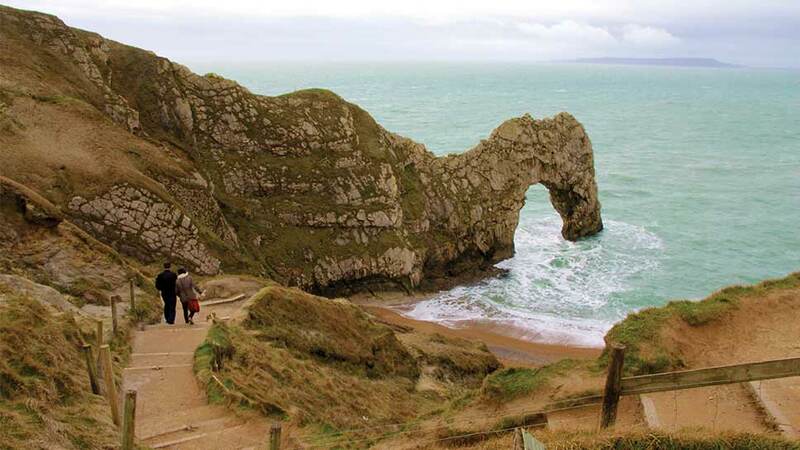 Walk one of England’s most scenic routes, with natural features like the breathtaking limestone arch of Durdle Door. Afterwards, you will need sustenance and a hot tea. Hix Oyster & Fish House (from local celebrity chef Mark Hix) overlooks the harbor in Lyme Regis and has stunning panoramic views across the coast. A daily changing menu serves up fresh, sustainable seafood, and locally foraged produce. 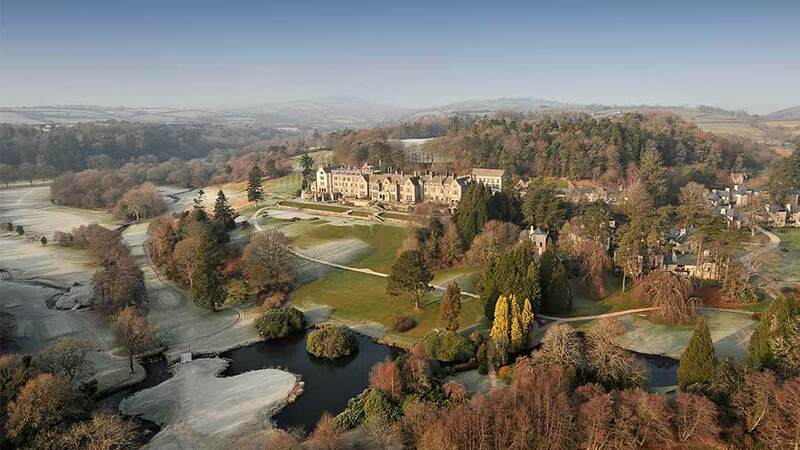 That evening, enjoy true English luxury in the sprawling Bovey Castle (boveycastle.com), which lies at the heart of Dartmoor National Park in Devon County. Complete with championship golf, horseback riding, and an Elan spa, this glamorous retreat transforms into a festive hideaway for December. The 5-star castle recently underwent a massive renovation accentuating its oak-paneled rooms, tremendous fireplaces, and ornate plaster ceilings. Stay in a traditional room or indulge in your own three-story country lodge. The castle sits on 275 acres of beautiful countryside and rolling valleys. If you time it right, arrive in time for their Christmas fair on December 13th with local arts and crafts gifts. Carry on to culture-rich Bristol, the largest city in Southwest England. This arty city is home to Banksy (take a street art tour showing many influential artists all around the city). They say, ‘if it can be done, you can do it in Bristol’, and this young, can-do attitude is apparent as you walk around the edgy city. Bristol has a progressive energy and is a great place for strolling. Check out the M Shed Museum and the premier attraction, the world’s first luxury liner, Brunel’s SS Great Britain. At the foot of the Cotswolds, stay in the stately, 16th-century Ellenborough Park (ellenboroughpark.com), a former country house of the Lord and Lady Ellenborough (tales describe her as a ‘scandalous society beauty’). This meticulously restored estate set on 90 acres, sits just adjacent to Cheltenham Racecourse (if you visit in December, make plans to see The International, a jump-racing event). Award-winning head chef, David Kelman, who has cooked for royal family, makes ample use of the bounty of produce from the surrounding region. His dishes are beautiful and complementary to the sophisticated Beaufort Dining room with stained glass windows and stone Tudor fireplaces. If you can break away from your new posh home, head over to mystical Puzzlewood (puzzlewood.net) in the Forest of Dean. This enchanting place was a film location for the latest Star Wars, plus it’s also said to be the inspiration behind J.R.R. Tolkien’s Middle-earth in the Lord of the Rings. Take an easy walk through some of the meandering paths flanked by gnarly, ancient trees, mesmerizing rock formations, and branches covered in velvety moss. Nearby to the forest is the lovely Tudor Farmhouse Hotel where you can stop for a lovely lunch or tea in a 13th-century converted farmhouse serving seasonal dishes made with homegrown ingredients. Linger in the Cotswolds for a few days if you can, before heading back to reality in London.